Years of armed conflict have disrupted health services in Iraq. The conflict in Iraq continues to take its toll by killing, injuring and displacing thousands of civilians. Many health facilities were destroyed, leaving the sick and wounded with no access to care. Millions of people continue to be affected by fighting and are in need of medical assistance. Since 2014, over 3.3 million people have been displaced across the country, and while many have found their way to camps, others are living in schools, mosques and unfinished buildings. The heartland of the Islamic Empire in the middle ages, Iraq gained independence from Britain in 1932. A US-led invasion in 2003 has lead to instability, with insurgents, including al-Qaeda, fighting for control. Médecins Sans Frontières/Doctors Without Borders (MSF) first worked in Iraq in 2003. Our work in the country has provided a response to armed conflict and healthcare exclusion. 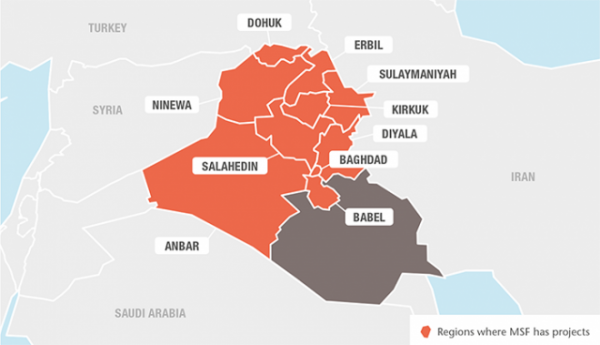 Although the conflict subsided in late 2017, humanitarian needs in Iraq remain extremely high. More than 2.9 million people have still not been able to return to their homes. MSF significantly stepped up its response in Iraq, providing trauma care and emergency surgery for war-wounded people. MSF teams also delivered basic healthcare, nutrition programmes, maternal health services, treatment for chronic diseases and mental health support for displaced people and others affected by the violence. MSF ran an emergency trauma surgery hospital in Hamam al-Alil, 30 kilometres south of Mosul, until July 2017. More than half of the trauma patients from the battle for west Mosul passed through this hospital. MSF also set up a primary healthcare centre in the town. MSF set up a 40-bed hospital department with Handicap International in Al-Hamdaniya, southeast of Mosul, to provide post-operative care and rehabilitation for people who had received emergency lifesaving surgery on or behind the frontlines. Many patients needed secondary amputations, wound cleaning and major internal surgery. During the battle for Mosul, thousands of people fled the city, seeking shelter in camps in Ninewa and Erbil governorates. MSF operated in 16 locations, providing primary healthcare, treatment for non-communicable diseases (NCDs), such as diabetes and hypertension, and mental health support, including psychosocial counselling and child therapy. MSF ran a maternity clinic with a paediatric unit in Tal Maraq village, which was in a disputed area of Iraq with limited access to healthcare. The clinic offers ante- and postnatal consultations and basic emergency obstetric care. General healthcare consultations, mental health services and treatment for NCDs were also available via mobile clinics deployed to surrounding villages. MSF’s field hospital in Qayyarah operated at full capacity, providing surgery, emergency and inpatient care, paediatrics, nutrition and mental health support. In June, teams started seeing and treating an increased number of babies who were severely malnourished. In July, an integrated nutrition and mental health project was launched in camps close to Qayyarah. The project treats children under the age of five for acute malnutrition. Throughout 2017, people fled Hawija district, often travelling at night on foot with little food and water. MSF’s mobile teams were located at key points to offer assistance. In January, MSF also started providing basic healthcare, emergency referrals, NCD treatment and mental health consultations in Daquq camp. In addition, MSF donated supplies and trained staff in the emergency rooms of the two main hospitals in Kirkuk city. After more than four years of operations, MSF handed over its sexual and reproductive health and maternity project in Domiz Syrian refugee camp to the Dohuk Directorate of Health in November. MSF expanded its project in Sulaymaniyah to support the huge influx of displaced people, setting up health promotion and mental health activities, including individual and group counselling sessions, in Arbat camp. MSF also supported Sulaymaniyah emergency hospital to improve standards of care and infection prevention and control, by training staff and refurbishing the emergency room and intensive care unit. The project finished in November. In Jalawla and Sadiya, MSF provides treatment for NCDs, mental health support and sexual and reproductive healthcare for families returning to the area. In 2017, MSF assisted with the rehabilitation of the towns’ primary healthcare centres and Jalawla hospital. Teams also provided NCD and mental health services in two camps for displaced people.